Stocks are under pressure to start the week, as earnings-season misses are grabbing headlines in the final days of January. But while the broad market holds more than a full percentage point in the red this afternoon, there are some silver linings to the storm clouds. One of those is the financial sector. Financials have pulled off a stunning about-face in 2019, rebounding from the steep broad market selloff in the fourth quarter of 2018. Since the calendar flipped to January, the financial sector has charged 8.5% higher, outperforming the broader S&P 500 index by a big margin. Year-to-date, one of the strongest performers has been Bank of America (BAC - Get Report) . BofA has, hands down, been the best-looking big bank from a technical standpoint. Shares are up more than 20% since the first trading day of 2019. Better yet, the price action is signaling that this big bank may just be pulling off the first stage of a much more long-lived reversal higher. To figure out how to trade it from here, we're turning to the chart for a technical look. There are a couple of important things to recognize on Bank of America's chart right now. First, there's the long-term downtrend that's harangued shares for much of the last year. So far, every test of trendline resistance has been met with downside. On the other hand, there's the reversal that BofA kicked off at the beginning of the year. These price moves may have sent shares in opposite directions, but they're reaching a similar conclusion this winter. The selloff-reversal cycle that started back in October looks like an inverse head-and-shoulders pattern, a bullish reversal setup that indicates exhaustion among sellers. So far, the pattern has established a left shoulder and head, but we're waiting on the right shoulder to form. That jives with the marginally overbought momentum in BofA following its swift up-move in 2019. Shares could be due for a pullback in the very near-term, forming the right shoulders. Don't let the silly name fool you; the head and shoulders an effective trading setup. An academic study conducted by the Federal Reserve Board of New York found that the results of 10,000 computer-simulated head-and-shoulders trades resulted in "profits [that] would have been both statistically and economically significant." For this price setup, the buy signal comes on a material breakout through the $30 price level. Coincidentally, that's also where long-term resistance currently sits. 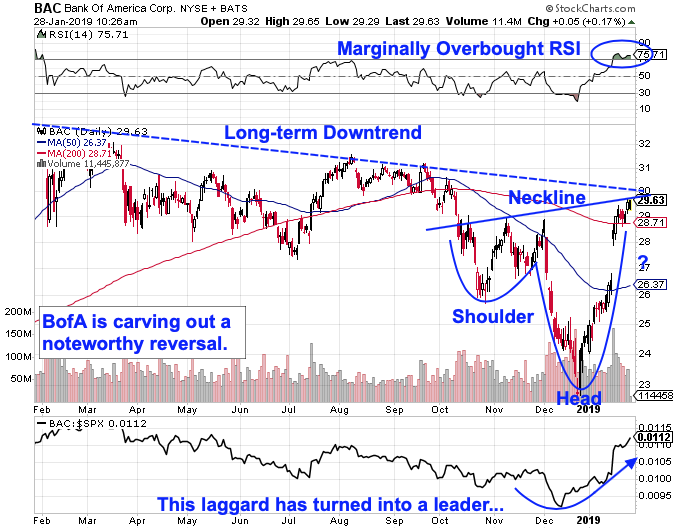 In other words, if BofA shares can muster the strength to break through the $30 price level, shares will have simultaneously signaled a buy on their inverse head-and-shoulders setup, and signaled a positive change in trend by breaking above their former downtrend. That confluence of independent signals makes a move above $30 more likely to stick. Still, risk management remains crucial - particularly given the size of Bank of America's up-move year-to-date. If you decide to pull the trigger on a $30 breakout, the nearest meaningful support level is at the $26 price level where the left shoulder found a floor. That represents 13% downside risk from the $30 level, indicating that this trade isn't for the skittish. Meanwhile, buyers look like they're building strength in BofA. A meaningful breakout above the $30 level means they're definitively back in control for the long-run. Shares of Bank of America closed Monday up 0.17%.